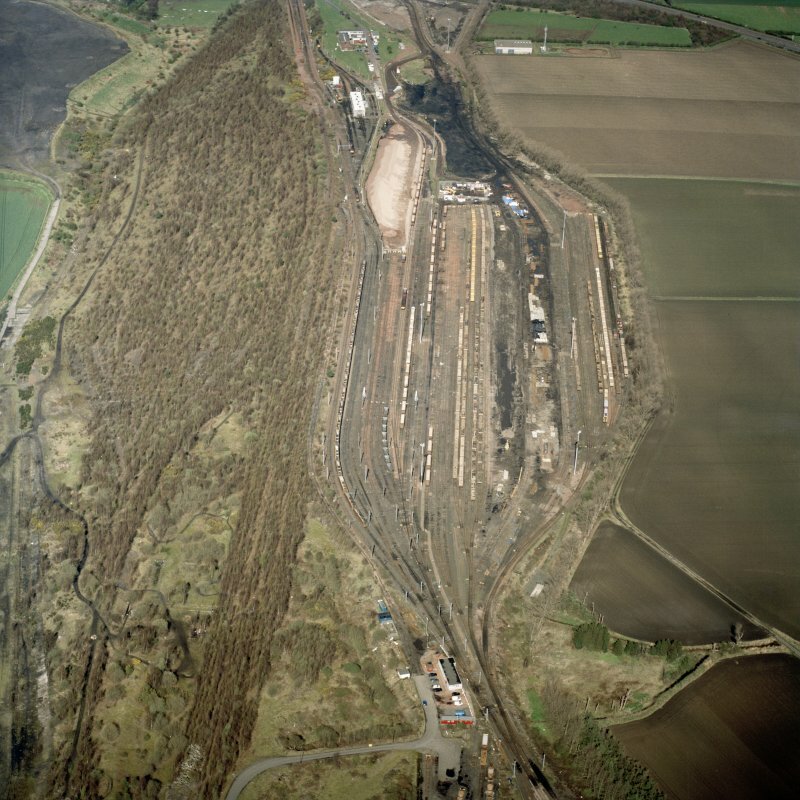 Oblique aerial view centred on the railway marshalling yard, taken from the SW.
Oblique aerial view of the marshalling yard, taken from the NW. 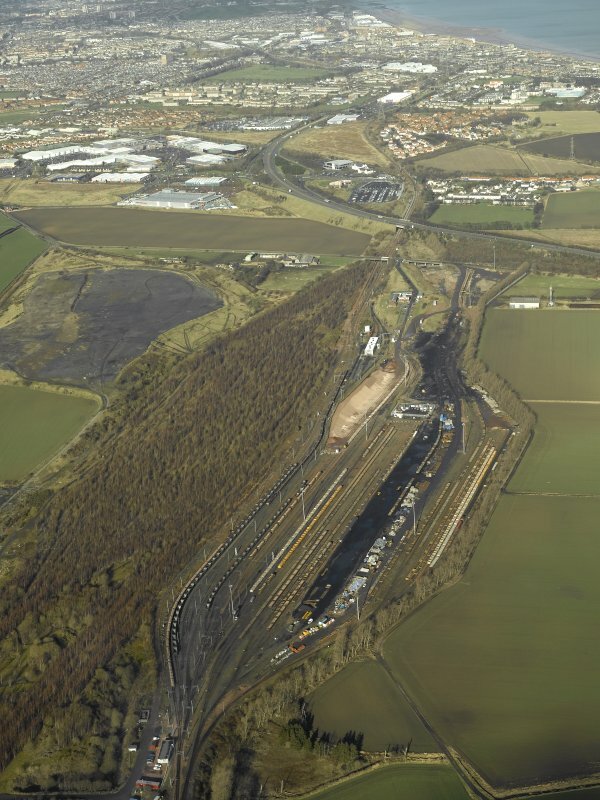 Oblique aerial view centred on the railway marshalling yard, taken from the SSE. 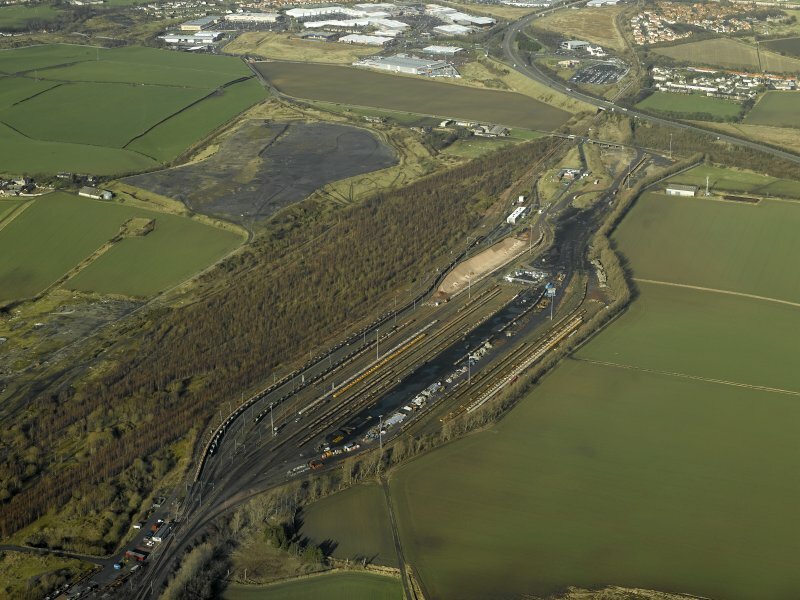 Oblique aerial view centred on railway marshalling yard showing area of former sidings on W side, taken from the SW.
Oblique aerial view centred on the railway marshalling yard, taken from the SSW. 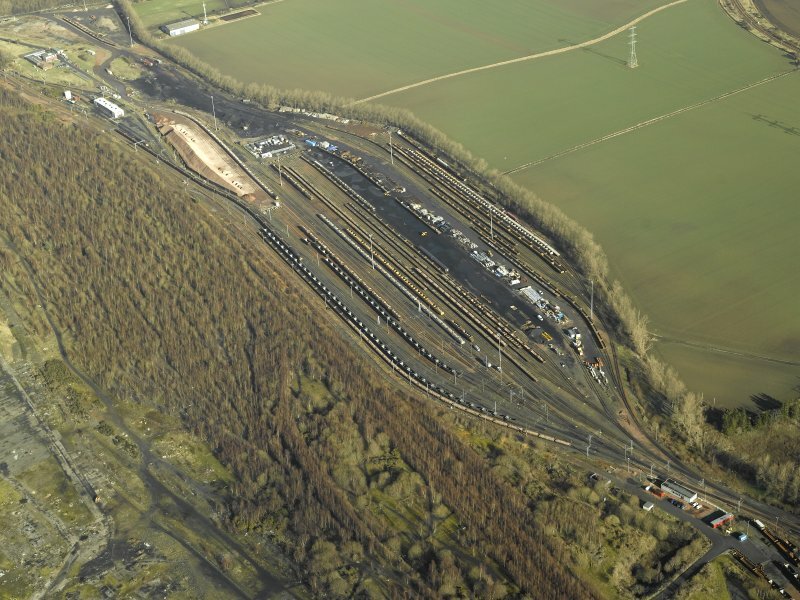 Oblique aerial view of the marshalling yard, taken from the NNW. 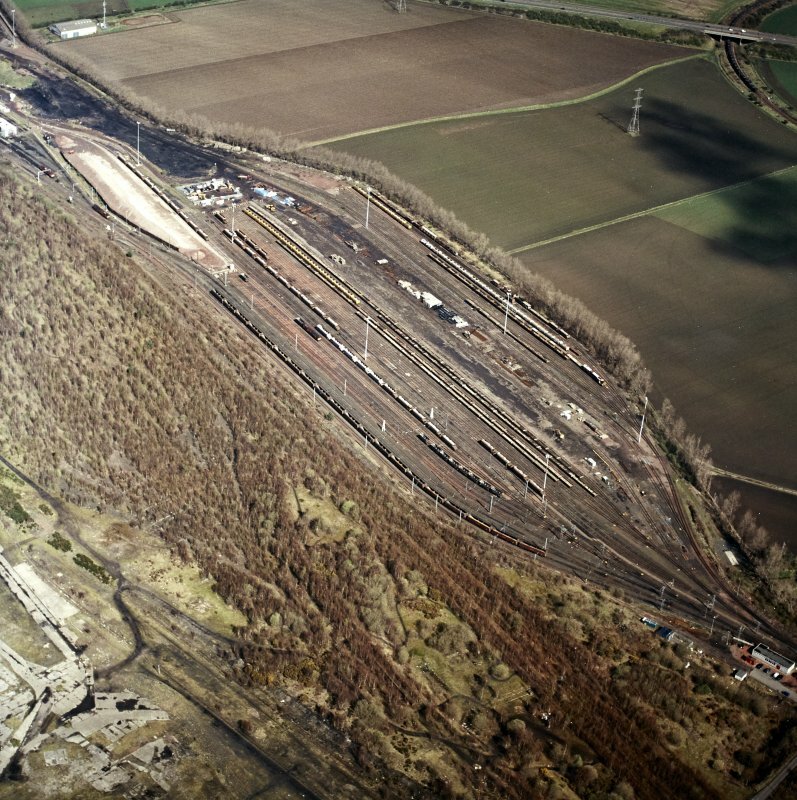 Oblique aerial view centred on railway marshalling yard showing area of former sidings on W side, taken from the SSW. 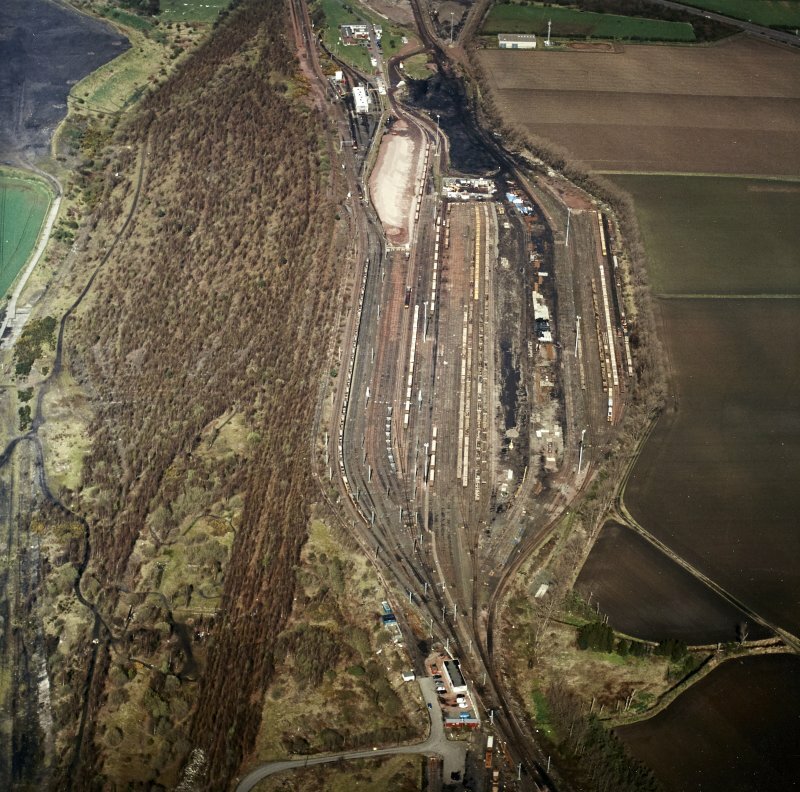 Oblique aerial view centred on railway marshalling yard showing area of former sidings on W side, taken from the SE. Extends into Inveresk parish and onto map sheet NT36NW. For adjacent Monktonhall colliery, see NT37SW 198. For Edinburgh and Dalkeith Rly viaduct at recorded location NT 3249 7025, see NT37SW 596. The provision of new and technologically advanced marshalling yards in Scotland was a major feature of the 1955 Modernisation Plan for British Railways, being intended to replace a far greater number of smaller yards of simpler design and more limited capacity. The five Scottish locations selected for construction or development were Thornton (NT29NE 14.00) in Fife, Millerhill, Perth (NO12NW 104), Cadder (NS67SW 55) to the NE of Glasgow, and Mossend (NS76SW 159) in South Lanarkshire. The first stages of this bi-directional automated hump marshalling yard were brought into operation in May 1962, both 'up' and 'down' yards fully commissioned by April 1963 at a total cost of £3 million. It straddled the Waverley route (to Carlisle) between Niddrie and the junction with the Loanhead branch, and was of traditional design, the 'up' and 'down' yards being almost identical with forty main sorting sidings. 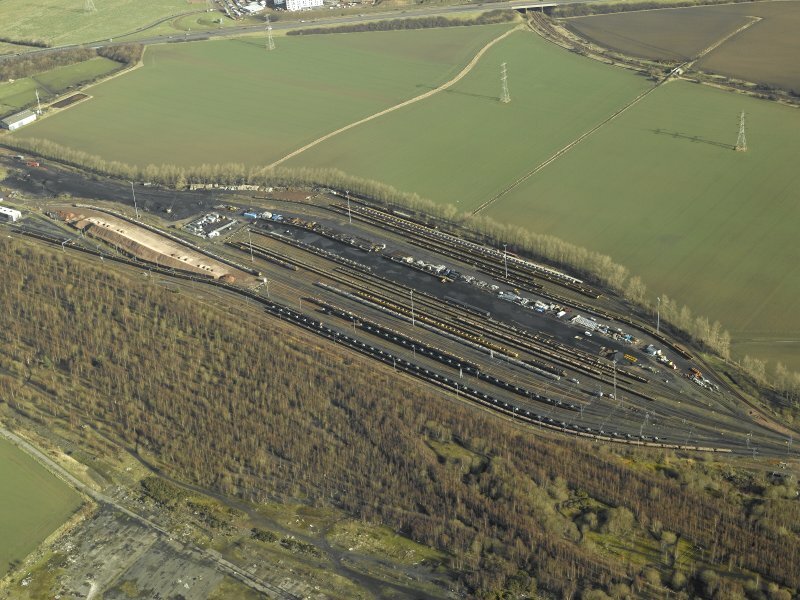 The former had an additional eight reception and ten secondary sorting sidings, and the latter had nine secondary sorting sidings and an additional set of eleven reception sidings to accommodate trains routed (via a new connection) from the East Coast Main Line. The secondary sorting sidings were not used for the detailed segregation of local traffic, but as flat sidings to sort some trains by the exchange of portions, without comprehensive remarshalling. Each yard had one primary and two secondary ('group') retarders, all supplied by Westignhouse. Hump operation was fully automatic, both primary and secondary retarders having radar and weight-sensing equipment; control was by 'cut card' and punched tape. The steepest hump gradient was 1-in-16, and the primary and secondary retarders were 75ft (22.9m) and 55ft (16.8m) long respectively. A new signal box was built at Millerhill to control 13.5 route miles of the Waverley route as well as access to the yard. This provided 328 route settings, was operated three signalmen, and replaced manual boxes at Niddrie South Junction, Millerhill Junction and Glenesk Junction. Carriage and wagon facilities and a cattle dock (for feed and water) were provided at the South end of the yard. Two goods loop lines, a through engine line, a departure line, and connections were also provided, as were a diesel locomotive depot and servicing facilities (including four 3000-gallon water tanks) for steam locomotives. The yard was initially highly successful, despite suffering the inherent problems of mining subsidence and a relatively remote location. Its hundred sidings were capable of handling up to 5000 wagons a day, greatly simplifying freight marshalling in the Edinburgh area. 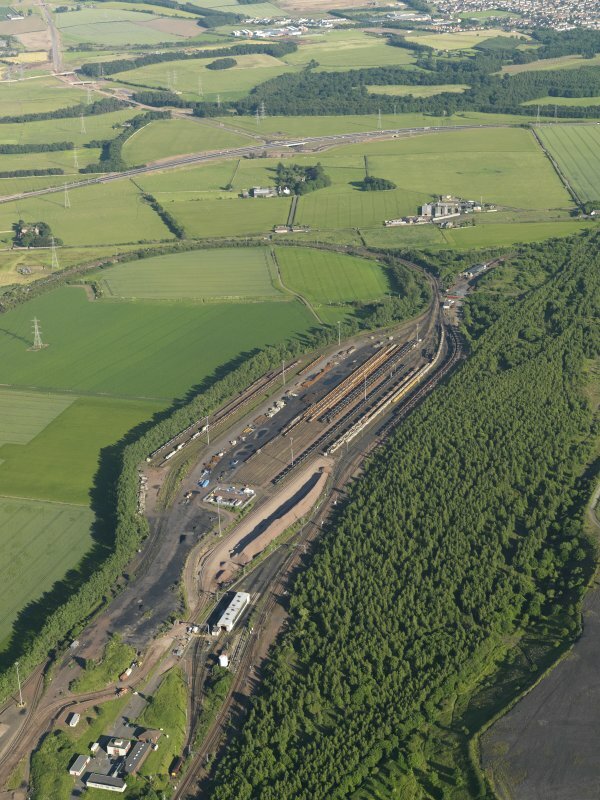 Consequent rationalisation of yards at Niddrie North and South (both closed), Joppa and Hardengreen (both closed), Portobello (closed) and Leith South (greatly reduced) resulted in a considerable reduction in 'trip' working, allowing repayment of its initial cost within about eight years of operation. 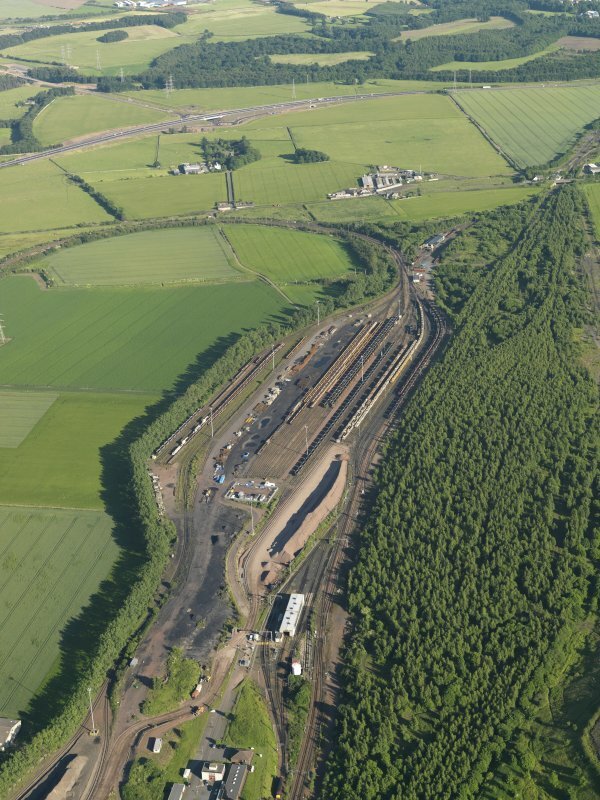 The 'up' yard was used mainly to marshal traffic for the East Coast Main Line and Waverley routes, as well as empty mineral wagons for Lothian collieries. The 'down' yard dealt, conversely, with traffic from the south, trains being made up for yards at Gunnie, Cadder, Perth, Slateford and Dundee. By November 1963, between 9,000 and 10,000 wagons were being handled each week in the 'up' yard, this figure rising to 11,600 in the seed potato peak. The average combined throughput of the two yards totalled about 4,000 a day. 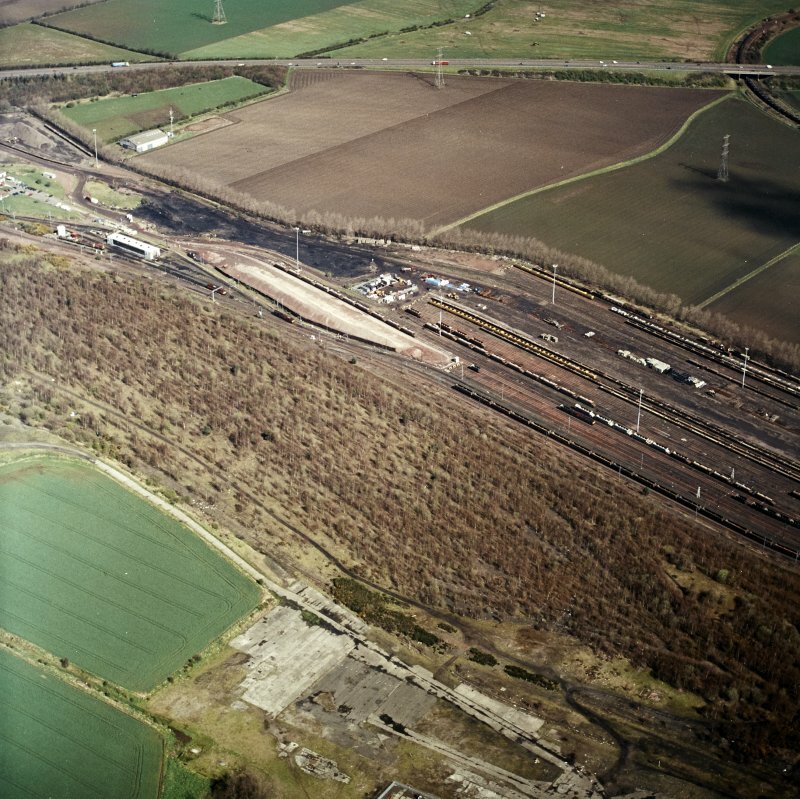 Use of the yard began to decline in the later 1960's, and the closure (in 1969) of the Waverley route occasioned the closure of the 'up' arrival sidings and hump, leaving an asymmetrical yard. The 'up' sidings were flat-shunted from the South, while the down yard continued in use as planned. Wagonload traffic continued to dwindle, and the reduced layout was never stretched. Ion 1975, TOPS computer wagon control equipment was installed, while some of the 'up' sidings were taken for civil engineering use and the rest retained as departure roads. All revenue-earning traffic was concentrated on the 'down' hump, which saw a daily throughput of 1500 wagons at this date; the daily departure list comprised 26 trains to ten destinations in Scotland and five in England. After this, traffic threough the yard continued to decline with the increasing volume of trainload traffic, mainly in coal, cement, limestone, spoil, petroleum products and anhydrous ammonia. By 1979, traffic through the yard had fallen to below 1,000 wagons a day, making closure inevitable. The 'down' yard closed in November 1983, the remaining facilities being used as a local service for the Speedlink opewarion in the Edinburgh area and to avoid trip working from Mossend yard (NS76SW 159). Some sidings remain in civil engineer's use, and a new arrival line has been constructed for trains from the East Coast Main Line. The approaches to the yard were electrified in 1991. (Illustrated with numerous photographs, and schematic plans as at 1962 and 1986).